Sicily (Italian: Sicilia an Sicilian: Sicìlia, [siˈtʃiːlja]; [sɪˈɕilja]) is the lairgest island in the Mediterranean Sea. Alang wi the surroondin minor islands, it constitutes an autonomous region o Italy, the Regione Siciliana (Sicilian Autonomous Region an sicilian Riggiuna Sicìliana). Sicily haes a rich an unique cultur, especially wi regard tae the airts, muisic, literatur, cuisine, airchitectur an leid. The Sicilian economy is diversifee'd. The agricultur sector is significant wi citrus fruits (mainly oranges an lemons), olives an olive ile, grapes an wine. Tourism an real estate are economically important for the island. Sicily an aa holds importance for aircheological an auncient steids such as the Necropolis o Pantalica, the Valley o the Temples an Selinunte. 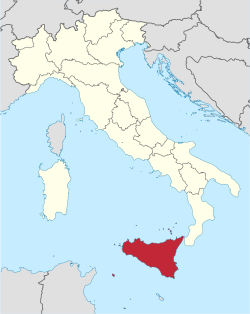 Admeenistratively Sicily is dividit intae nine provinces, each wi a caipital ceety o the same name as the province. Sma surroondin islands are pairt o various Sicilian provinces an aw: Aeolian Islands o Messina, isle o Ustica (Palermo), Aegadian Islands (Trapani), isle o Pantelleria (Trapani) an Pelagian Islands (Agrigento). ↑ "Eurostat - Tables, Graphs and Maps Interface (TGM) table". Epp.eurostat.ec.europa.eu. 11 March 2011. Retrieved 2 June 2011. ↑ Population May 2011, data from Demo Istat. Wikimedia Commons haes media relatit tae Sicily. This page wis last eeditit on 28 Februar 2018, at 11:56.